September 24, 2018 /3BL Media/ - T. Rowe Price’s tenth annual Parents, Kids & Money Survey revealed an increase among parents of 8 to 14 year-olds in effective college savings attitudes and behaviors and a decrease in anxiety about college costs when compared with results from the ninth and eighth annual Parents, Kids & Money Surveys. “This September we have a real reason to celebrate College Savings Month: More parents are doing the right thing to financially prepare for college costs,” says Stuart Ritter, CFP®, a senior financial planner at T. Rowe Price. “A stronger aversion to student debt, increased usage of 529 college savings accounts, and a decrease in parents pulling money from college savings for other expenses are very positive developments. T. Rowe Price encourages parents to invest in their kids’ futures by saving for their college education and discussing money matters with them at least weekly. The survey found that young adults, ages 18 to 24, who discussed financial topics with their parents when they were younger are more than twice as likely to have money saved for their own kids’ college (14% vs. 6%). To help parents discuss money with their kids, the firm created MoneyConfidentKids.com, which provides free online games for kids; tips for parents that are focused on financial concepts such as goal setting, spending versus saving, inflation, asset allocation, and investment diversification; and classroom lessons for educators. Fewer parents are losing sleep over college costs: Only 27% of parents report losing sleep over college savings costs this year, compared with 41% who reported the same in 2017 and 42% in 2016. Parents are less willing to take on college debt themselves: Only 14% of parents are willing to take on more than $75,000 in student debt for their kids’ college this year. In comparison, 26% of parents were in 2017 and 28% were in 2016. Most parents (61%) say they are willing to take on less than $25,000 in college debt this year. In 2017, only 43% were willing to take on less than $25,000 in college debt and 42% were in 2016. 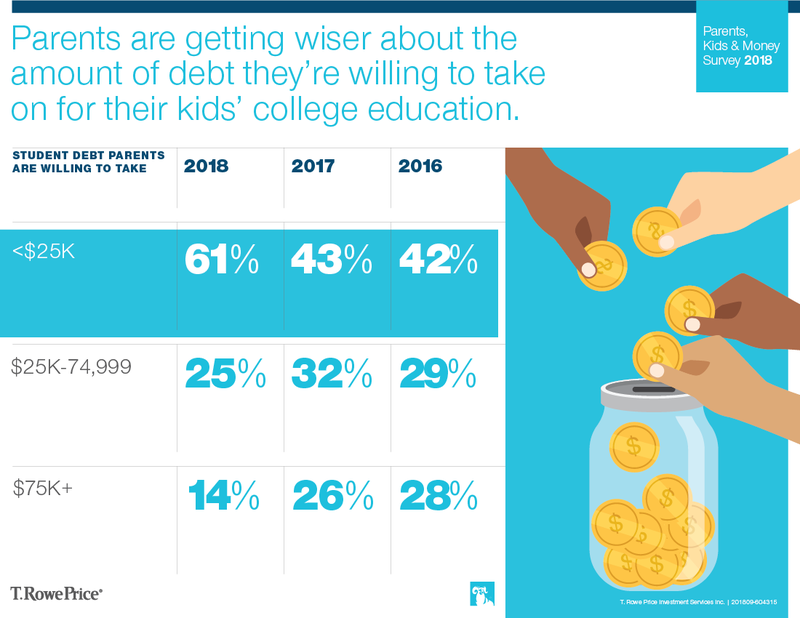 Fewer parents have pulled money from their college savings in the past two years: 89% of parents who have college savings say that they’ve never taken money out of their kids’ college savings in the past two years for reasons other than education costs. However, in 2017, only 68% of parents had not pulled money from college savings in the past two years and only 55% in 2016. More parents are using 529 college savings accounts: 44% of parents are saving for college in a 529 account in 2018, now making it the most popular way to save for college among survey respondents. In 2017 and 2016, regular savings accounts had been the most popular way to save for college, and only 27% were using 529 accounts in 2017 and 37% in 2016. Most parents are willing to send their kids to a less expensive school to avoid student debt: 74% of parents say they would be willing to send their kids to a less expensive school to avoid student loans this year, while only 62% would in 2017 and 71% would in 2016. Many parents have more than $25,000 saved to cover college costs: Among parents who have money saved for their kids’ college, 39% have $25,000 or more saved. Parents with higher amounts of college savings are more likely to have 529 accounts: 67% of parents with more than $100,000 saved for college are using 529 accounts, while only 27% of those with less than $5,000 saved are using 529 accounts. Emergency funds are associated with fewer college savings account withdrawals: 73% of parents who haven’t taken money out of their kids’ college savings do have an emergency fund, compared with only 42% among parents who have taken money from their kids’ college savings accounts. Misconceptions about 529 accounts are still common: One-third of parents mistakenly believe that they will lose any money left in a 529 account if their child doesn’t go to college or if there’s money left over after they finish. While taxes may be assessed on any distributed earnings, you never forfeit the contributions made to a 529 account. Similarly, almost half of parents (48%) believe that contributing to a 529 account will impact their ability to get financial aid later, when in actuality their total personal savings make up a small portion of the Federal Student Aid formula used to consider financial aid eligibility, and the biggest determinant is personal income. Parents continue to prioritize their kids’ college over their own retirement: 74% of parents say that saving for their kids’ college is a higher priority than saving for their own retirement. This is up from 2017 and 2016, when 68% and 67%, respectively, said college was a higher priority than retirement. T. Rowe Price recommends prioritizing retirement savings over college savings, since there are far fewer options to cover the costs of living in retirement outside of personal savings. The tenth annual T. Rowe Price Parents, Kids & Money Survey, conducted by Research Now, aimed to understand the basic financial knowledge, attitudes, and behaviors of both parents of kids ages 8 to 14 and young adults ages 18 to 24. The survey was fielded from January 16, 2018, through January 23, 2018, with a sample size of 1,013 parents and 1,000 young adults ages 18 to 24. The margin of error is +/- 3.1 percentage points. All statistical testing done among subgroups (e.g., those who had financial education vs. those who did not) is conducted at the 95% confidence level. Reporting includes only findings that are statistically significant at this level. Founded in 1937, Baltimore-based T. Rowe Price Group, Inc. (NASDAQ-GS: TROW) is a global investment management organization with $1.09 trillion in assets under management as of August 31, 2018. The organization provides a broad array of mutual funds, subadvisory services, and separate account management for individual and institutional investors, retirement plans, and financial intermediaries. The company also offers a variety of sophisticated investment planning and guidance tools. T. Rowe Price's disciplined, risk-aware investment approach focuses on diversification, style consistency, and fundamental research. For more information, visit troweprice.com or our Twitter, YouTube, LinkedIn, Instagram, and Facebook sites.